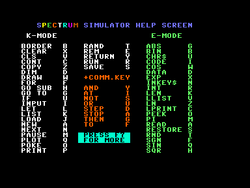 An emulator is a special computer program that simulates, or "emulates", another (usually older) computer system, e.g. a C64 home computer on an Amiga or PC. An emulator should be a perfect clone of the computer system it is emulating, including CPU, memory management, sound, graphics and peripherals. Emulators make it possible to use old software such as games and applications on modern computers using a modern OS. An overview of available emulators is given in the portal of emulators and in the Category: Emulator page. This page was last modified on 2 November 2018, at 10:29.